Extra crispy Parmesan garlic fries are baked in the oven, instead of fried, for a healthier french fry recipe! 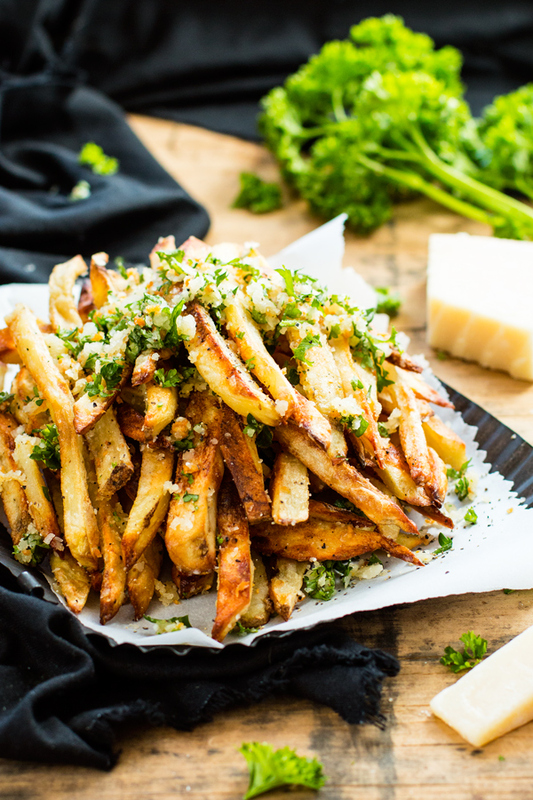 Top this Parmesan fries recipe with a bit of garlic and parsley coating for the ultimate gluten-free side dish recipe. BRING ON THE BAKED GARLIC PARMESAN FRIES!! Parmesan and garlic are a match made in heaven. Turn that epic combo into these super crispy baked Parmesan garlic fries and you have yourself a super quick and easy-to-make side dish. Many times when we go out to eat at restaurants I am hesitant to order fries. Although potatoes are technically gluten-free, the oil in which restaurants fry them in is generally cross-contaminated with other flour-coated items. Yucky, bad-for-me oil + traces of wheat flour = an unhappy tummy. Wanting to healthify the classic french fry recipe, I set out to make these Parmesan garlic fries by baking them in the oven instead of deep frying them. The goal was to achieve the same ratio of crispy : soft and not sacrifice too much on flavor. Extra crispy Parmesan garlic fries are baked in the oven, instead of fried, for a healthier french fry recipe! Top them off with a Parmesan, garlic and parsley coating for the ultimate gluten-free side dish recipe. Peel and cut potatoes into matchstick slices, ½ - inch wide and ¼ - inch thick. Place potato slices in a gallon zip-top bag and toss with olive oil, ½ teaspoon salt and ¼ teaspoon pepper. Layer potato slices in a single layer on each baking sheet. Bake fries in preheated oven for 30-35 minutes, flipping halfway through. During the last five minutes of baking, heat butter and garlic over medium heat in a small saucepan for 1-2 minutes, stirring constantly. When garlic starts to brown, remove from heat. 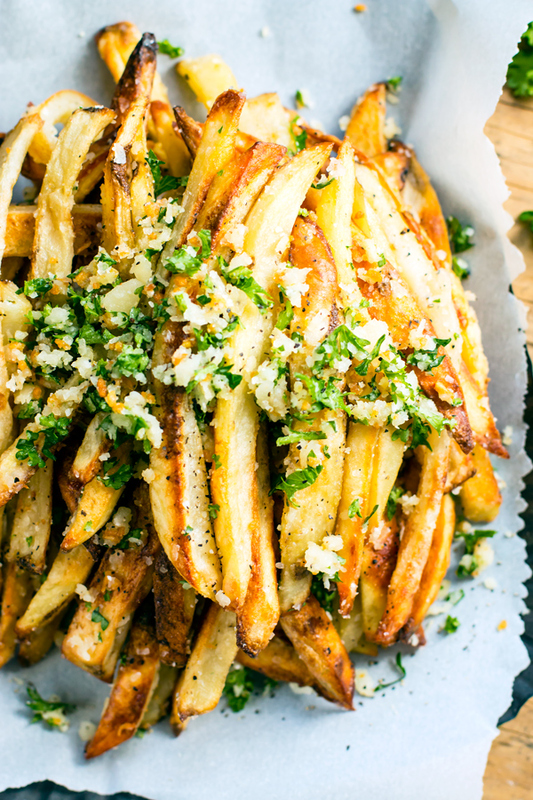 In a large bowl combine fries, garlic butter, ½ teaspoon salt, ¼ teaspoon pepper, Parmesan, and parsley. Toss until fries are evenly coated. *Can also use vegan butter or olive oil if vegan. 0 Response to "CRISPY BAKED PARMESAN GARLIC FRIES "